On the first weekday after an indulgent occasion like Valentine’s Day, you might notice colleagues pouring packets of Sweet’n Low in their coffee or sipping a Diet Coke instead of the regular, sugared variety. You might even do it yourself. Personally, I became doubly interested in the history of artificial sweeteners as a user of sugar-free products but also from my academic preoccupation with consumption. I’ll return to this point soon, but first I’d like to share some fascinating parallels between the substances some of us study and artificial sweeteners I found in historian Carolyn De La Peña’s Empty Pleasures: The Story of Artificial Sweeteners from Saccharin to Splenda. Though it’s a matter of some debate among health officials, a worrisome public, and most importantly drug historians, sugar and its artificial counterparts are not “drugs” per se. Nonetheless, the latter share many characteristics with “modern” drugs, starting from saccharin’s invention and continual refinement in the industrial age. In 1879, Johns Hopkins University chemist Constantin Fahlberg accidentally stumbled upon the solution while attempting to formulate a new food preservative. After serendipitously tasting the residue of an apparently unremarkable batch, he noted its extreme sweetness and took to calling it “saccharin,” meaning of- or similar to sugar. Fahlberg quickly sought business partners and tirelessly marketed saccharin to food and beverage manufacturers over individual consumers. This wholesale strategy worked as manufacturers recognized the solubility of saccharin, its relative cheapness vis-a-vis sugar, and the volatility of sugar-producing states. 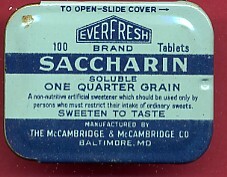 Like many drugs in the early twentieth century, saccharin also grappled with the Progressive regulatory impulse. Many beverage companies had replaced sugar with the non-nutritive sweetener before the labeling requirements of the 1906 Pure Food and Drug Act. Unwitting consumers had no idea they were ingesting anything other than cane sugar, which they understood to be part of a wholesome diet. Sugared food and beverage producers furthered that impression with advertisements branding saccharin-laden competitors as unnatural and non-nutritive. Further, like drug policy the fate of artificial sweeteners occasionally became a hot-button political issue. Throughout the 1950s and 1960s, several major studies on the health effects of saccharin had proved inconclusive. 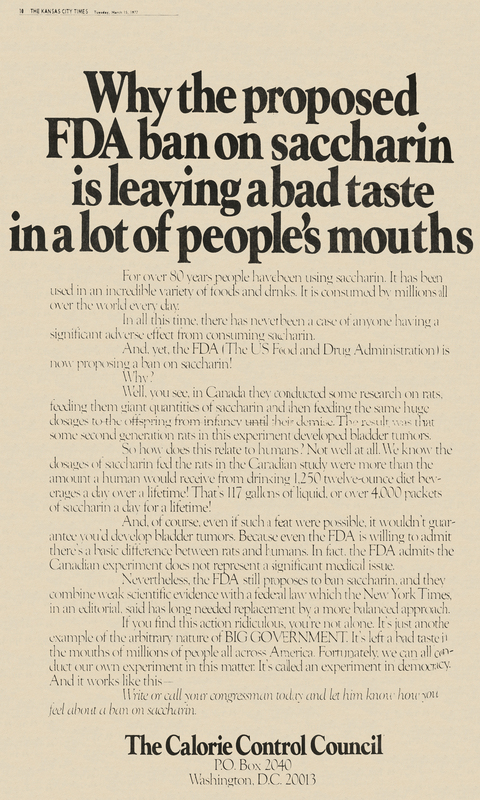 A 1977 trial by the Canadian Health Protection Board found a link between saccharin consumption and bladder cancer, but only at amounts equivalent to over 800 diet sodas per day. Still, in March of that year the Food and Drug Administration announced their intention to ban saccharin on January 1, 1978. Hundreds of thousands of protest letters swiftly flooded offices of the FDA and elected representatives. Writers mocked the extreme research circumstances, promoted their right to choose, and shared deeply personal stories of weight loss attributed to saccharin. (Of course, saccharin producers also did their part to rile up consumers.) The FDA eventually relented to political pressure. Americans might have distrusted saccharin, but they feared the alternative more. Ever since, Americans have continued to consume more and more brands of artificial sweetener. Aspartame (NutraSweet) soon supplanted saccharin, until both were dwarfed by sucralose (Splenda). In addition to its sugar-like taste, sucralose could be used in baked goods (unlike its predecessors, which chemically broke down at high temperatures). This brings me to my ultimate point: highlighting the phenomenon of consumption and its implications. In Empty Pleasures, De La Peña takes care to investigate what these products meant to customers (or users) and how they used them. Early twentieth-century Americans were repelled by the absence of sugar in their consumables. 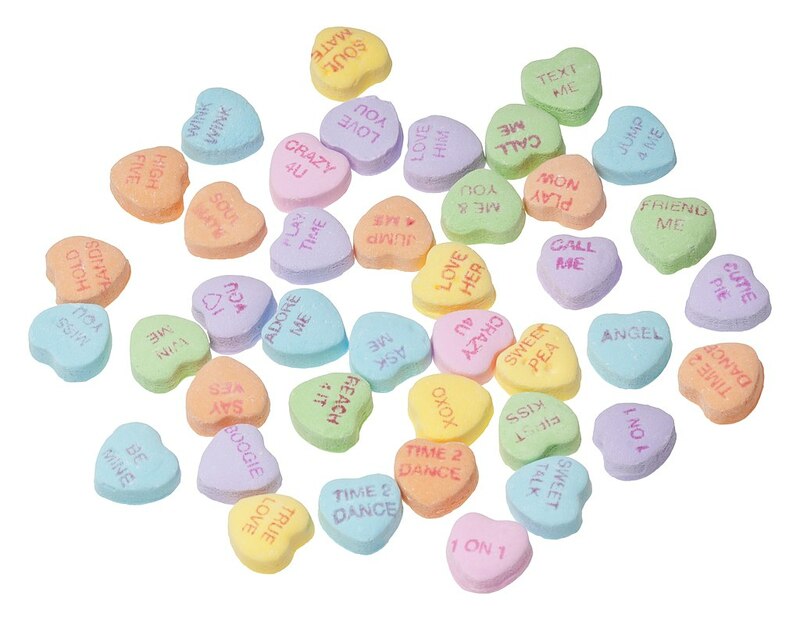 Conversely, some enjoyed saccharin for its health potential. Wartime women adopted saccharin for its gustatory appeal and perhaps to maintain a sense of normalcy as they were denied a culinary staple. By 1977, the prospect of banning that product so incensed Americans that they appealed to the highest levels of government. Drug historians have done excellent work in policy, policing, treatment, and social and medical attitudes toward addiction. Still, I was reminded by Bob Beach’s recent post that we need to keep an eye on users and, critically, use itself. As he noted, finding them in the archives is an understandably difficult task. But I believe it will make for some sweet, sweet scholarship. I cannot find the study that compared aspartame vs. sugar in patients with a history of depression with those with no history of depression, but I remember they terminated the study early because of the severe deprssions in those with a history of depression. We describe a new term: glutamate-based depression (GBD). GBD is defined as a chronic depressive illness associated with environmental stress and diseases associated with altered glutamate neurotransmission. We hypothesize that glutamate-induced over-activation of extrasynaptic NMDA receptors in the subgenual cingulate area called Brodmann’s 25 plays an important role in the etiology of depression and may be responsible for the high incidence of co-morbid depression associated in diseases with glutamate etiology. While depression is a syndrome with multiple possible etiologies, we propose that a disruption in glutamatergic neurotransmission may underline a substantial proportion of clinically observed depression. The high rates of depressive symptoms associated with various disorders in which altered glutamatergic functions have been identified, may suggest a common pathophysiological mechanism is underlying the diverse clinical presentations.